I really love these fresh orange recipes and you will too after tasting the bright citrus flavor. How does homemade orange creamsicle cake from scratch, juicy orange chicken and orange pumpkin bread sound? That and more below. Thinner skinned oranges tend to be juicier than those with thicker skins. The tangerine is another name for the Mandarin orange variety. They are sweet and high in antioxidants. Their growing season is from November to early spring. Recommended use is eating them out of hand, fruit trays and fruit salads. Valencia oranges are sweet and difficult to peel. The growing season for Valencia oranges are from March to June. These oranges are used for juicing. Navel and Seville oranges are seedless and easy to peel. Their growing season is from October to April. Navel and Seville oranges recommended use is just eating them out of hand. Tangerines have a delicate flavor and have less acid than oranges. They are easy to peel. Their growing season is from November to spring. The recommended use is eating out of hand and salads. They are not for cooking. Clementines are small, thin skinned and easy to peel. They have few to no seeds. Their growing season is from November to January. The are used for eating or salads. Satsumas have lower acid, are seedless and easy to peel. Their growing season is from December to April. They are only used for canning. Their are a mandarin-pomelo/grapefruit hybrid. Their growing season is from January to March. They are used for salad dressings and sauces. 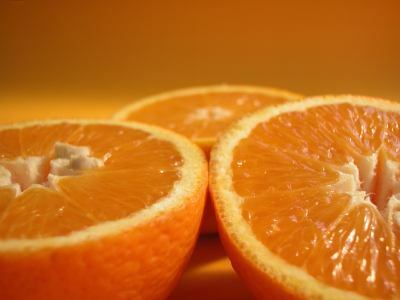 Oranges will keep at room temperature for three or four days, and up to two weeks if refrigerated. Mandarins and tangelos are more delicate and should NOT be kept at room temperature for more than a day or two. They will last up to a week in the crisper drawer of the refrigerator. Cut chicken breast into 1/2-inch cubes, set aside. To make marinade - combine egg white, salt and sugar in a bowl and stir vigorously until ingredients are thoroughly mixed. Add chicken cubes to marinade and stir to coat well. To make orange sauce - combine water, ketchup, sugar, vinegar, soy sauce, 4 teaspoons cornstarch and sesame oil; stir and set aside. Place a pot over high heat. When pot is hot, add the 2 tablespoons vegetable oil and heat. Add orange peel and scallion and stir for about 20 seconds, taking care not to burn the orange peel. Pour combined sauce ingredients into the pot and cook, stirring frequently, until sauce has thickened, about 12-15 minutes. Preheat 4 cups oil to 350-375°F. Meanwhile, put marinated chicken in the plastic baggie containing the cornstarch. Shake chicken well for about 20 seconds or until chicken is covered with cornstarch. Shake off all excess cornstarch and fry chicken in hot oil until golden brown, approximately 2 1/2 minutes. Remove chicken from oil with a slotted spoon, drain well and set aside. Add fried chicken to pot with heated orange sauce, stir for about 30 seconds, then serve immediately. This fresh orange recipe is so simple to make and delicious. I usually double or triple this recipe. More marmalade recipes. Be certain when you purchase the naval orange that it has a thin skin. If the skin is thick, the marmalade will be bitter. Wash the orange and cut off both ends. Cut the orange in half, and cut each half in eight sections. Place the orange sections in a food processor or blender and pulse until the peel is in tiny pieces. Put the processed orange in a saucepan and add the water and sugar; bring to a boil. Boil for approximately 12 minutes, stirring frequently. Cool and place in a glass jar with a tight fitting lid. When it is chilled, it is ready to eat. Now that's an awesome fresh orange recipe. PREHEAT oven to 350 degrees and grease/flour two loaf pans. Add the raisins to the orange juice and let them soak. In a large mixing bowl, cream the shortening and slowly add the sugar beating at medium speed. Add the eggs, beating after each one. Combine flour and the next five ingredients; add slowly add to the creamed mixture alternating with the pumpkin. Add water and orange juice. Stir in raisins and orange rind. No time for homemade? This fresh orange recipe for cake will make them think you made it from scratch. PREHEAT oven to 350 degrees and grease/flour a 9x13" pan or a bundt pan. Combine the first five ingredients in a mixing bowl and beat thoroughly with a mixer at medium speed. Pour into the prepared cake pan. Bake for 35-45 minutes or until the top springs back when lightly touched in the center. When cake is done, poke the entire top of the cake with a fork. Next, to make the glaze - combine the fresh orange juice and powdered sugar and mix until smooth. Pour glaze over the cake and serve. I have more than fresh orange recipes. Be sure to check out more fruit dessert recipes below.